Boss Log Splitter Buying Guide | Which Model is Right for You? You are here: Home / Boss Log Splitter / Boss Log Splitter Buying Guide | Which Model is Right for You? Which Boss log splitter should you invest in? To be truthful, you can’t go wrong with any of these log splitters featured in this article. Every Boss log splitter is built to high standards and are well regarded by consumers. The key question is: Which size wood splitter do you need? In this article we focus on several of the best Boss log splitters specifically for homeowners. We hope you find this to be an informative resource to help you decide where to put your money. Winter is coming, and all of you folks who live in the countryside are probably getting ready with your snow blowers and shovels because there is going to be a lot of snow lying around for you to clear. You’re probably going to need a bit of firewood as well, for feeding your fireplace, unless you have a more “modern” house with an electric furnace instead of a wood powered one. But hey, firewood is not something that is required only during winter, as it is a year-long necessity for folks who live in the countryside, rural areas, and outskirts. After gathering the logs, you need to prep the firewood for feeding into the stove or furnace. Holding that trusty old wood splitting maul, you begin to hammer away at your pile of wood. After about half an hour of perspiration-packed splitting action, you realize that your back is not what it used to be 10 years ago. Or maybe you just have a gigantic pile of wood, and the thought of going through all of that with a mere wood splitting maul is taking its toll on your mind. Yes, you could split all that cord of firewood with your bare hands, but it would take a monumental effort and leave you with a sore back. And, that’s where technology steps in. Meet the venerable log splitter, a machine that is simplistic in its operation, yet so very productive and helpful. If you don’t own one of these bad boys already, and tend to process piles of firewood logs multiple times a year, then you definitely should spend the money and do your body a favor. In this article we shall talk about why you need a log splitter, how it works, the types of log splitters, and also cover a few Boss Industrial (Boss is one of the most respected splitter manufacturers) log splitters in detail. We shall also discuss about how you can choose the right log splitter for your needs, and give you a rundown on the pros as well as cons of each type of log splitter. In the end, we shall cover some of the basic safety principles and guidelines that you need to follow while operating one of these machines. So if you’ve never heard about or operated a log splitter, this article is a must-read for you so that you can get out there and buy the perfect log-murdering machine for your needs. So strap in and sit tight, because this is going to be a rather long ride (or read). We have a lot of educational information for in this article, which we’ve decided to present later in this article. Typically, readers want to get straight to the products they are researching so we’re trying out this new format to see what readers think. Basically, if you want to learn about log splitters, just skip the first section of this article where we review the lineup of Boss log splitters. Great for splitting firewood. Can be used indoors — no fumes! ✓ View or download the MANUAL (Boss EC5T20). If you’re primary goal is to split those small-medium sized logs of aspen, basswood, alder, and similar softwoods, then the Boss Industrial EC5T20 will help you get the job done much faster and smoother than is possible with any axe or maul. Yes, it is one of the weakest machines out there in terms of raw tonnage, but basswood, alder, aspen, and cottonwood have Janka hardness scores below 600. By applying 600 pounds of force, you can easily half-insert a 0.444” stainless steel ball into a 1-2 inch thick plank (seasoned, with less than 15% of moisture content) made from any of these woods. How does that relate to machine tonnage? We have already explained it in previous sections, but here is a quick method that you can use to determine how much force your machine is actually applying on the wood. Our Boss EC5T20 right here has a rated pressure of 2700 psi (may vary depending upon voltage, current fluctuations, etc. ), and features a cylinder bore of 2.2”. In order for us to get the amount of force that the ram is capable of applying on the log, we calculate the area of the cylinder (square inches), and multiply it with the maximum pressure (pounds per square inch), which gives us force in pounds. For the EC5T20, the area turns out to be 3.8 square inches, and when we multiply this number with the pressure rating of 2700 psi, we get a net force output of 10,260 pounds. Now that force is pretty close to 5 tons, so Boss is clearly not playing around with their advertised ratings and as you can see, this is more than enough force to crush any softwood. Just remember that this machine is capable of handling logs as large as 10” x 20.5”. However if you exceed that limit, then you run the risk of overloading the machine. The cycle time is a pretty decent 14 seconds, which is still better than what any normal human being can hope to achieve while splitting a 10” wide log of wood. Oil capacity is 3.8L, and you don’t get a dual stage pump so the reset phase is a little slower than the cutting phase. Despite all of its minor deficiencies, this machine does what it’s meant to, faster than any human being can. You can go through an entire cord of wood within a couple of hours with this machine, and you won’t even have to shed a single drop of sweat. The 1.8 horsepower 3400 rpm high current brushless motor packs plenty of torque, and runs virtually silent. Since this towable unit weighs just 107 pounds, you can comfortably attach it to the back of your truck, SUV, or tractor, or even the ATV. The most popular size. Perfect for 90% of homeowners. 1500W motor with max speed of 3400 rpm : 13.5 Amp. 2 year residential, 180 day commercial warranty. Hydraulic pressure of 3500 psi. Cycle time : 14 seconds. ✓ View or download the MANUAL (Boss EC7T20). If the 5 tons of splitting force on the EC5T20 just doesn’t cut it for you (no pun intended), then the 7 ton model might be better suited for you. This is actually the most popular size from the Boss series of log splitters. It’s the right balance between price, size and power. It hits the sweet spot for most homeowners — not too big and not too small…just right. The ES7T20 uses a 1500 watt electric motor with a maximum rpm of 3400 — very similar to the 1.8 horsepower 3400 rpm brushless motor that is fitted on the EC5T20. But, it amps up the pressure in the hydraulic system to 3500 psi, which is about 30% more than what our little 5-ton electric model had to offer. This way, even though the bore size is kept to 2.2”, we get a near 30% increase in tonnage from 5 to 7 tons. Tonnage or crushing force can be found (in pounds) by multiplying cylinder bore area (square inches) with the fluid pressure (in psi) inside the cylinder. So, all they did was change the pump and the hydraulic pipelines (3500 psi is a lot of pressure, you need super tough pipes to handle it). So by keeping the motor, hydraulic ram, frame, and rail same as before, Boss managed to keep the weight of this machine down to just 117 pounds despite its metal construction. Maximum splitting diameter, splitting length, cycle time and oil capacity are exactly similar to that of the 5-ton EC5T20. So basically, the Boss ES7T20 wood splitter is a beefed-up EC5T20 with extra tonnage and nothing more. And it weighs about 10 pounds more, settling in at 117 lbs. The built-in wheels make it easy to move around. A major benefit in purchasing an electric log splitter is that you can use it indoors as well since there are no fumes for you to worry about. So, in the middle of winter you can actually split your firewood in your garage, cabin or even your living room if you want. It truly is a compact log splitter that will neatly fit in any corner of the room. Dual direction splitting means you can split wood from either side. 8-tons of splitting power. 2 Hp / 12 Amp motor. 1500W high current brushless motor running at 3400 rpm. Dual action splitter, 8 tons of splitting force for forward motion and 7 tons of splitting force for backward motion. Hydraulic pressure of 3400 psi, along with a 2.5” cylinder bore. Cycle time of 9 and 13 seconds for left and right movement respectively. ✓ View or download the MANUAL (ED8T20). Because 3500 psi is about as high as you are supposed to go while designing a hydraulic system, in order to increase the tonnage of a splitter then you must make the cylinder bore larger; which is precisely what Boss did with the ED8T20. It has the same 1500W brushless electric motor that we have in the ES7T20, although this time the maximum pressure has been shifted down by 100, to a very safe 3400 psi. This will not bring about any huge increase in pump or pipe lifespan, but will at least mean that you have slightly more headroom to play with if you overload the splitter, say while attempting to cut a knotted 10” x 20” log of dogwood or elm. Boss Industrial managed to get away with a slightly lower psi rating because they fitted a 2.5” bore hydraulic cylinder in this bad boy, instead of the 2.2” cylinder that we had in both the EC5T20 as well as the ES7T20. That means the weight was also bumped up by a significant margin, over to 161 pounds. However, Boss also implemented a neat little extra feature that puts this splitter in a whole new class when compared to its two little brothers. That feature is dual-action cutting. This splitter can split logs in both the forward as well as return cycle, and features a cycle time of 9 and 13 seconds for left and right movement respectively. Yes, the total cycle time is a lot slower than most, but it also chops twice per cycle. Oil capacity is 3L, and the warranty is similar to that of previous models at 2 years. *Requires a 20 Amp circuit to operate. The built-in stand means you won’t have to hunch over; making it comfortable to use. Feed cycle time of 16 seconds, with a retract cycle time of 13 seconds. 1800 Watts, 15A electric motor. 10 tons of splitting force. Dual direction splitting : Splits both ways. Extra wide tube log trays. The ED10T20 is a heavy-duty log splitter for homeowners; it pushes the limitations of electric power to its limit. It features a dual action splitting mechanism. A powerful 1800W, 3400 rpm high current brushless motor has been fitted in this 214 pound machine. It can generate the requisite 3200 psi of pressure needed to push the 2.8” bore hydraulic cylinder with a force of 10 tons. That’s about as powerful as any electric log splitter can be, and you will have no trouble while splitting up 10-12 inch logs of hardwood. Sturdy build-quality that will last you years to come. The cycle times however are a matter of concern, since it is the slowest Boss Industrial splitter on this list. The feed cycle alone takes up 16 seconds of time, while the retract cycle takes 13 seconds. Thanks to a dual stage pump, the ram retracts faster than it extends but also loses about 1-1.5 tons of force while retracting. Maximum splitting length was kept at 20.5”, but Boss increase the splitting diameter to 12” because of the 10 ton rating. Failure to operate the log splitter in this position can result in serious injury or death. The oil capacity is 3.2 L despite a much larger 2.8” cylinder, which explains why this machine has such long cycle times — the volumetric flow rate is just not that good, especially because so much more oil has to be pumped into the cylinder within the same amount of time in order to achieve the same displacement as before (compared to a 2.2” or 2.5” bore). Nevertheless, this machine capable of fulfilling the needs of any homeowner unless you deal with super large logs of hardwood, in which case the next Boss machine might be what you’re looking for. Heavy-duty gas log splitter that will quickly split wood. Fully towable. 16 tons of spltting force : Dual action splitting. One-handed operation / 3 position control. Towable log splitter. Wheeled trailer jack included. Remember when we said 3500 psi is considered an extremely high pressure in most consumer grade log splitter machines? Well, the Boss Industrial GD16T21 is not strictly a “consumer” grade machine. It is a gas-powered workhorse that has been designed with one purpose in mind- to split the hardest logs of hardwood, and to do so at insanely fast rates. Seriously, you need an assistant to help you with the loading process as you operate this beast, since its cycle time is so low that you’ll actually not be able to feed logs to it as fast as it can split them. Boss says that this is their fastest gas powered log splitter yet, and it is- boasting a blazing fast cycle time of just 3 seconds (maybe 4 seconds sometimes, but that is still crazy fast). Now you begin to understand why they fitted a 14-quart oil tank and have 6.5 horsepower Kohler 4-stroke engine in there. You see, tonnage is one thing and speed is a totally different thing. Tonnage is decided by the pressure as well as bore of the cylinder, and even though some splitters feature tonnages exceeding 20, their cycle times are often north of 10 seconds. If you want speed then you need to pump lots of hydraulic fuel across the system really, really fast. And that is precisely what happens with the 4200 psi of pressure and the 14 quart oil tank (14 quarts is 13 liters). Cylinder bore is 3”, which when coupled with the insane 4200 psi, takes the tonnage of this machine up to an impressive 16 tons. It is also dual action, meaning that you can achieve 2 cuts per cycle. Maximum splitting length is 21”, and maximum splitting width is 13.5”. It packs a 0.95 gallon fuel tank, and comes with log cradles. Road-safe 16” tires are included, and one-handed operation is supported. You can use the 2” towing coupler and towing chains to hook up this 306 pound metal log splitter with your tractor, ATV, SUV, or truck. Buy the 16-ton Boss Industrial GD16T21 log splitter from Amazon. A worthwhile addition to your log splitter as it splits more efficiently. With this 4-way cross wedge from Boss, you can transform your regular single action log splitter into a pseudo dual action machine. How? 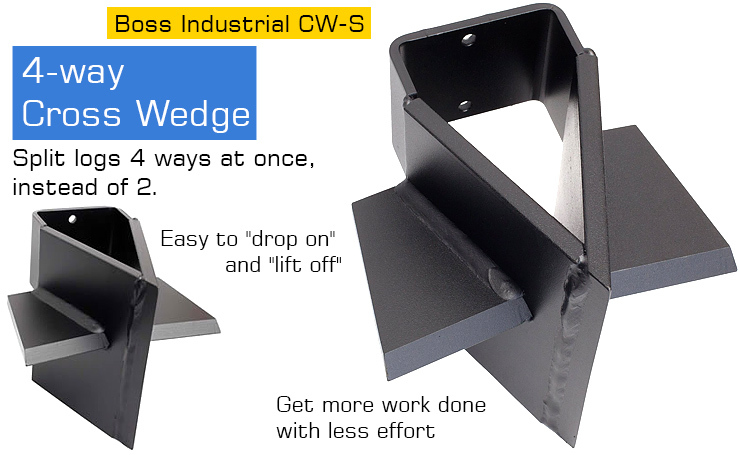 Just attach this 4-way edge by dropping it onto the existing wedge, or you can remove the default wedge and hard fit this stainless steel attachment. *It is NOT compatible with 10-ton models and above, so before you go out and buy one of these inexpensive performance boosting attachments check the model number of your log splitter. Designed to elevate the splitter and make it more ergonomic and comfortable. This particular accessory is basically a height-boosting attachment that will only fit the Boss Industrial ES5T20 or ES7T20 Boss log splitters. By mounting your 5 or 7-ton splitter on this stand, you will be able to access and operate it much more easily, since both of the aforementioned machines do not come with stands of their own. The 2 rear legs have wheels on them, while the 2 front legs act as handles because of their slightly angled shape. Everything on this splitter stand is made from premium grade tubular stainless steel, except for the wheels. Protects against UV damage, rain, dirt, birds and tree sap. Elastic Hem Cord In Bottom keeps it secure. Compatible with all Boss Industrial gas log splitters, and other most popular gas log splitters, with a full beam up to 82″ L x 45″ W x 34″ H (in the horizontal position). The CV1 is a log splitter cover that has been made from specialized weather-X fabric (that is how Boss markets their nylon + polyester blend). The elastic hem cord at the bottom allows you to secure this 82” x 45” x 34” cover around even the largest of Boss log splitters. The fabric is both UV resistant as well as waterproof. It will protect your log splitter from rain, dust, sleet, snow, sun, etc. no matter whether it is parked in the open, or inside the barn. Visit the Boss Industrial site to learn more about their products. To rest of this article is focused on log splitters in general. It provides you with the knowledge you need to fully understand how log splitters work, log splitter safety, as well as technical details to help you get the most from any wood splitter. Operate the log splitter on flat, even ground. Block the wheels so that your splitter does not move while it is in operation. Operate it in daylight, and under proper artificial lighting. Remove spilt wood/splinters immediately so that you or someone else does not accidentally trip over them. Always operate the machine in an open space to reduce the risk of carbon monoxide poisoning. Always place your hands on the SIDE of the log instead of the end while you place it inside the wood splitter. Always wear safety glasses and gloves while working with a wood splitter. Check all parts for hydraulic fuel leaks before operating the machine. Ensure that screws, latches, bolts, clamps, etc. are properly tightened. Never put a log in the splitter if it has nails or knots in it, or if the ends are not properly cut (square cut). Never put your finger inside a crack or split in the log, as these may close extremely quickly while the log is being compressed in the machine, and splinters of wood may pierce your fingers. Never stand in front of the machine when it is operating, as stray pieces of wood may strip off and fly into you. Never operate the machine without checking hydraulic oil levels or pressure levels. Some machines require you to open the air release valve before you turn them on, failing which your machine will not operate at maximum efficiency. Never operate a machine without checking for fluid leaks. 3000+ psi of pressure is extremely high, and if the fluid is ejecting out of a small hole the oil line, the concentrated needle-like oil jet may even pierce your skin and clothes. Do not move your log splitter over hilly or rough terrain without a proper tow vehicle. Turn off the fuel supply before towing, and never exceed 35 mph when the splitter is in tow. Always choose a log splitter based on what you NEED, rather than what you WANT. Buying an excessively powerful and expensive splitter does not mean that you’ll magically split your logs faster. If you care about speed more than anything else, then look for splitters with small cycle times. If you are willing to trade in a bit of speed for additional power, then get something with a high tonnage and large bore. Log splitters with high pressure levels and small bores will be fast, but lack tonnage. Splitters with large bores and moderate-high pressure levels will pack plenty of crunching power, but fall behind on speed. Sometimes, you get splitters that are both fast as well as powerful- but these will cost a fortune, so get them only if you intend to get a large amount of logs to split (4-5 cords a year, or more). If the splitter works faster than you can feed it, you’re basically wasting a large chunk of the cash that you spent. So it’s important to do your research, consider which type of wood you’ll be cutting (softwoods, hardwoods, green/seasoned wood, etc.) and also factor in the average log-size that you’ll be dealing with. Set a budget and decide how quickly you want to get through a cord of wood. Then make the decision based on what you NEED, with about 15-20% of headroom for future expansion. Why do You Need a Log Splitter? This should come as no surprise, since a wood splitter does all the work for you and all you need to do is load the logs onto the rail. The split log pieces will fall into the tray, and the machine will keep running without slowing or tiring. Some log splitters also include a loading lift with which you just have to gently roll a log from the pile onto the platform of the lift, and then you can conveniently use the lift to put the log on the rails of the splitter. If you regularly deal with logs of wood that are 24” wide and over 2 feet long, then these platforms can act as a true godsend for you. Besides, you can’t really split curved logs or knotted logs that easily with your hand. If you try to go through oddly shaped pieces of wood with an axe, you risk injuring yourself as well as bystanders because of the way your axe will react upon the impact. It may fly sideways, or send splinters of wood flying at high velocities through the air if you strike the curved log at an odd angle. For this particular section, we intend to give you an estimate of how fast a wood splitter actually is in comparison to axes or mauls — even if the one operating the axe or maul is a seasoned pro. Which is why, we shall introduce to you the World Lumberjack Men’s champion, Jason Wynyard. He is an extremely tough and experienced lumberjack who has been hacking, slicing, and dicing trees all his life. Fast and tough — no nonsense log splitter that gets the job done. Back in 2006, Jason used a five-pound axe to split a log of Aspen that measured 12” in diameter and 28” in length. How much time did it take him? A mere 15.94 seconds- and this record stands till date. For the average male lumberjack, we would put this number around 50-100 seconds. And that timer only gets longer as you begin to age and lose your speed as well as strength, not to mention your stamina. Now, we will compare Jason’s feat to the Dirty Hand Tools 100171. This gas powered beast of a log splitting packs 22 tons of crushing force that is capable of reducing even the hardest logs of oak into little pieces of firewood, within seconds. The 6.5 HP 196cc Kohler engine inside the DHT 100171 drives the dual stage 13 gpm (gallon per minute) pump, and moves the piston inside the 4” wide hydraulic cylinder that has a stroke of 24”. So how does this machine perform in comparison to our World Lumberjack champ? Well, it beats him. And by quite a significant margin, because the ram on this model has a cycle time of just 10.9 seconds, which is the amount of time that the wedge needs to travel 24” forward and return to its original position. Also, this is not even the fastest log splitter around. The average gas powered log splitter will have a cycle time between 10-12 seconds, while the fastest models boast cycle times of 3-5 seconds. Also, Jason had to spend most of his energy and focus while trying to get through the 12” wide log in order to set that record, and that is not a speed he can maintain over the duration of a few hours. Like we said, it is not something everyone can hope to replicate, and after a couple hours of splitting logs by hand, you’ll probably lose 15-20 percent of your starting speed as well. Most male lumberjacks will average about 70 seconds, while older people might even take 100 seconds or more to get though a log that is 12” in diameter. Fiskars X25 vs Powerhorse M1175D. Let’s be honest, a log splitter is faster and safer. However, the average 20-ton gas powered splitter can slice through a log as long as 30” and as wide as 24”, within 10 seconds (including the reset time). If you have a double-action splitter, then you can even chop the logs once more as the blade is returning to its original position. Talk about productivity! Of course, splitting times will depend on the size of the log as well as its thickness, but the speed of log splitting machines really begins to show if you split hardwood logs of a larger size (12” wide and above, with a length of at least 20”). 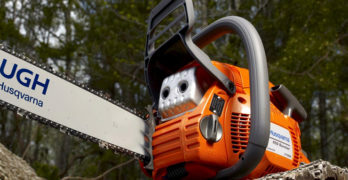 On an average, a gas-powered splitting machine with a 10-15 ton rating (the optimal tonnage for most homeowners) can go through a cord of wood within an hour, while the average lumberjack would need at least 5 to 6 hours IF he worked non-stop without taking any refreshment or breaks. Sure, hacking up logs by hand is an incredibly satisfying feeling and teaches us patience as well as perseverance. It also tones the body and is one of the best workouts for a country man, not to mention the fact that you can impress the spectating ladies with your lumberjacking skills, since there is no better way to show off your manliness and rugged nature than go through giant piles of wood with nothing but an axe and your hands. However, if you care more about speed and efficiency rather than impressing the ladies, you know what you need. Before we explain how a log splitting machine works, you really need to know about the two types of firewood as well as the hardness rating of wood. This is quite interesting because the type of wood that you’re splitting plays a significant role in determining the tonnage and type of splitting machine that you need to buy. Firewood is supposed to have low moisture content, typically around the 12-15% mark. Decreased moisture content allows the wood fibers to burn more easily, and they produce will also generate more heat per pound. So there are basically two types of wood- seasoned wood and green wood. Green wood is the term given to freshly chopped wood that has been obtained from recently felled trees. This wood is rich in moisture content (more than 60-70% moisture), and is not the best for use as firewood. However, if you leave this wood out in a pile or stack so it can dry under the sun, it will gradually turn into seasoned wood. Air also plays a major role in moisture removal, and whole logs need much more time to dry because they are covered by a protective layer of bark and have lesser surface area. If you split the logs then the overall surface area of wood exposed to sunshine and air increases significantly, and it can lose most of the moisture content much more quickly in comparison to non-split logs of green wood. Non-split logs can take up to a year to season, while split logs of the same species will usually dry within 6 months. The hardness of a wood determines how much force you need to apply to the log in order to split it apart. In order to know how much tonnage you need on your new log splitter, take some time and think about the type of wood that you will be splitting. If you take a log of dried aspen and measure its weight, you’ll find that it weights nearly half as much as an equally sized log of seasoned oak. Do you know why? Well, the wood fibers in the log of oak are packed much more densely in comparison to the aspen sample, which is why oak is both harder as well as heavier. The amount of heat released from a log of wood depends on the amount of flammable fuel content (wood fibers) present in the log. Yes, the temperature at which the two logs burn will be similar, however a log of oak packs much more heat content than an equally sized log of aspen and will also provide heat for much longer as it burns. Here are some numbers – A cord of aspen will release 18 million BTU’s when combusted, while a cord of oak will release nearly 30 million BTU’s. A cord is the unit used to measure a large quantity of firewood logs. One cord occupies 128 cubic feet of space, and measures 4’ x 4’ x 8’. Depending on the size of logs and how densely or tightly they are stacked on top each other, the average cord of wood contains anywhere between 75 to 90 cubic feet of wood, as we are obviously ignoring all the space occupied by air pockets in that 128 cubic foot space. BTU stands for “British Thermal Unit” and is the amount of heat required to raise the temperature of one pound of water by 1°F, or approximately 1055 joules of energy. Going back to hardness of wood — there is a standard rating system used to give an indicative measure of how hard or soft a certain type of wood is. This is known as the Janka hardness rating, determined by the Janka hardness test. The Janka hardness of a particular type of wood is measured by calculating the amount of force (in pounds) it takes to embed half of a stainless steel ball that measures 0.444” in diameter, inside a seasoned plank of said wood type. Normally, the test plank measures anywhere between 1 to 2 inches in thickness, and has a moisture content of less than 15%. This is not a real-world scenario by any means, but is an indicator of how hard you can expect a certain type of wood to be, as well as well as how hard it is in comparison to another type of wood. For example white oak, which is classified as a hardwood, scores 1360 on the Janka scale while basswood scores a mere 410. So, it takes 1360 lbs of force to embed half of the 0.444” steel ball inside a plank of white oak and in the case of basswood the force required is just 410 pounds. Simply put, any wood with a Janka rating of more than 900 is classified as a hardwood, while woods with a Janka score of less than 900 are classified as softwoods. This may seem irrelevant, and you might be thinking what all of this has to do with your selection of a log splitting machine. Actually, the tonnage rating of your brand new log splitting machine will be decided by the Janka score of the wood that you plan to cut. If you intend to deal with hardwoods, then get a splitter with at least 10 tons of piston force in order to stay on the safe side. However, Janka ratings are not the sole determining factor when it comes to choosing the tonnage of your splitter, and we are going to discuss why that is the case in the next segment. For now, just remember that the harder the wood, the more tonnage you will need in order to split its log. What are Tonnage Ratings and why they Matter? All log splitter machines carry a certain tonnage rating which is basically an indication of how much force they can generate while splitting a log of wood. But tonnage alone does not decide how good a machine is at splitting wood. Unlike an axe or splitting maul, log splitters rely on brute force instead of speed and sudden impact. They basically squeeze the log of wood between a footplate and a wedge. Either the wedge or footplate/baseplate is driven along a metal rail by a hydraulic ram. When a company states that model X is a 10-ton splitting machine, they refer to the amount of force that the piston in the hydraulic cylinder can generate on the service end. Generally, harder woods require extra tonnage in order to split cleanly. For example, any wood that scores more than 1500 on the Janka scale should be split by a machine with at least 10 tons of hydraulic force. And that number is for smaller logs, with diameters up to 6”. If you plan on splitting logs that are both hard as well as big, then you need even more tonnage. For example, if you take a log of basswood that is 24” in diameter and more than 24” long, you probably need a splitter with at least 22 tons of force in order to split the log. Even if basswood is one of the lightest and softest woods around, the sheer thickness and diameter of the log can cause your machine to go into overload midway if it does not have sufficient tonnage. With hardwoods, the biggest challenge is generally getting through the first 5 to 6 inches of the log. Once the wedge has planted its full width inside the log, it can rip through at an accelerated rate. Also keep in mind the fact that in most cases seasoned wood is slightly harder to split than green wood. Because when the fibers dry up they tend to bond together more tightly, causing the wood to harden. However, you should not notice this difference unless your machine is really stretching the limits in terms of maximum tonnage, so if it is barely able to get through a 24” piece of oak when it is green, don’t even bother with trying to process seasoned oak inside the machine. Some woods may even get softer as they season, because of the way their fibers react to a fall in moisture content. Whatever the case, you must always cut your green wood early and split it as soon as possible so that it is nice and dry by the end of the year, when you need it the most. Remember that strength alone does not determine how well a machine can split logs, even though it DOES indicate how quickly the machine does its job. If you wish a clean and well cut grain, take a look at the size and shape of the wedge. With machines that have lower tonnage, the wedge generally tends to be narrower towards the back in order to compensate for the lack of driving force. This is actually better for splitting small logs since the machine will slice through them faster thanks to a narrower wedge, but if you load up larger logs in a machine with a marrow wedge, you will end up with half-split logs that need to be taken apart manually or put on the rail for a second splitting attempt. Piston size and travel distance also matter, but we shall discuss all that stuff in the section below, where we have covered how a hydraulic log splitter works. For now, remember that 10 tons of force is the sweet spot when it comes to splitting wood for home usage, however you can get away with as little as 5 tons if you primarily cut woods with a Janka rating below 600-700 (such as alder, aspen, basswood, etc. ), and if the size of your logs is within 12” x 24”. On the other hand, do not consider a machine with tonnage less than 22 if your primary workload consists of hardwoods such as elm, oak, dogwood, hickory, maple, walnut, etc. If the logs are hard (Janka rating above 1000) as well as large (bigger than 18” in diameter), so get a 25+ tonnage machine in order to stay safe. A hydraulic log splitter is definitely an incredibly powerful machine and is capable of generating insane levels of force in order to split even the hardest logs of woods on Earth. However, its basic principle of operation is not at all complicated, and you’ll be surprised to know that the entire hydraulic cylinder and piston assembly is quite similar to the innards of a water gun. Hydraulics are used in extremely intensive workloads across a wide range of machines such as cranes, trucks, aircraft, automobiles, construction machinery, etc. but every single hydraulic system in all of these machines, including the one in our log splitter is based on the exact same concept. When you connect two pistons via a tube filled with incompressible fluid, and press on one piston, then the piston at the other end of the tube will move forward. That is because the pressure generated at one of the tube is transferred to the other end via the fluid. When you press the handle on an old — school water gun, the sudden compression causes water in the cylinder to rush out at extreme velocities. Even though you are moving the handle relatively slowly, the velocity and pressure of the fluid rushing out at the other end is really high. However if you take this gun and attach a tiny tube to its nozzle, and pump water INTO the cylinder, then the piston is going to move backwards. With a hydraulic jack, what you do is apply X pressure at cylinder A to generate Y pressure at cylinder B. If cylinder B has 10 times the diameter of cylinder A, for every 1 meter that you push the handle of cylinder A, the piston of cylinder B will rise by 10 centimeters. However, if you applied 10 Newton of force on A, the amount of force that the piston of B will apply is 100 Newton. So you are trading travel distance or speed, for an increase in force. With a log splitter, the engine/motor drives a pump that is connected to an oil container, as well as a network of hydraulic tubes. The hydraulic ram is connected to a base-plate or wedge, and it moves forward or backward depending on which valve the pump is pumping hydraulic oil into. Depending on the diameter of the hydraulic ram, and the power of the driving motor, your log splitter can generate anywhere between 5 to 45 tons of force, although you rarely need more than 22 tons of force for general home usage. Even 10 tons is plenty for most households who just need to split a cord of firewood into smaller pieces for the furnace. When you decide to buy a new log splitter after reading about all its benefits and how it can speed up your workflow, you will be rather taken aback when you encounter the thousands of models and brands that are currently available in the market. We shall leave it up to you to decide which log splitter is the best for your needs, however you must first know what parameters you need to focus on, as well as the different types of splitters out there. We shall start by introducing you to the 5 primary types of log splitters currently available on the market for commercial usage. These are the cheapest as well as the most compact type of log splitter available out there. They are a step up from axes and splitting mauls, however if you want to cut more than a few pieces of wood daily, these are not ideal. They require manual pumping of the hydraulic ram, and are actually quite similar to car jacks, except that in this case you are using the hydraulic power amplification to drive a wedge into a log of wood, rather than lifting a 4000 pound car. If you like exercise then a manual splitter might be what you want. You have a small amount of really hard firewood. You are incapable of heavy physical tasks, or are a senior citizen. You need a log splitter, but have a super limited budget. Time is not a constraint, and you just want to get work done by applying as little manual labor as possible. Electric log splitters have their pros and cons. For starters, these are probably the quietest log splitters out there, since there are no noisy gasoline engines to generate ear-blasting levels of noise. They are more environment-friendly as well. Before you laugh though, think about this- you are already harming the ecosystem by chopping down trees and causing deforestation. So why add to your environmental footprint even further by running a gas-guzzling splitter all day long? Instead, get one of these- they barely make any sound (within 60 decibels when the motor is running), and do their job much faster than even the most powerful gas powered models. Where these begin to gall off however, is when you consider the fact that they need a power outlet in order to function. 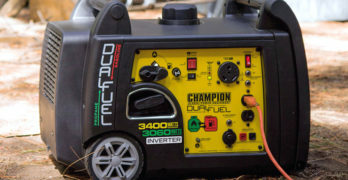 It is not possible to magically spawn a power outlet in the middle of the field, jungle, or riverbed, where you might be spending most of your time splitting logs. Sure, these units can be towed in the back of your truck or car, but they still need a power supply to function. Even though they are lighter than similarly rated (in terms of tonnage) gas models, electric splitters are ironically less portable. Also, there is a limit to how much power you can deliver to the hydraulic pump via an electric motor. True, high-current brushless motors these days are capable of matching some lower end 4-5 horsepower IC engines, but they will also weigh more than the electric motor in your average 5-8 ton electric splitter, and the extra weight defeats the only real advantage that electric splitters had over gas types, apart from their lower sound emission levels. Yes, they are also more environment-friendly, but we guess that most of you don’t really put too much stress on that aspect of a LOG splitting machine, right? This is what most homeowners should buy, if they intend to split multiple cords of wood per 6 or 12-month cycle. If you are dealing with large logs of hardwood, then gas splitters are the way to go. These beasts generate upwards of 10 tons of force, and can go all the way up to 45 tons or even more, in the case of industrial grade log splitters. Engineered to split large volumes of wood all day long. You rarely need more than 25 tons of force in the hydraulic ram, and sometime the cycle speed as well as the wedge shape can make the difference between a good splitting machine, and a poorly optimized splitting machine. Gas models are extremely loud and most will generate 65+ dB of sound, and they also emit fumes. But if you want your work done fast and clean, then get one of these. Most of them come in both horizontal as well as vertical implementations and are towable. This is a special type of log splitter that it attached to the three point tool behind a tractor, and its hydraulic pump is fed by the tractor motor. Most 3-point hitch splitters are rated at 20+ tons, and come with both vertical as well as horizontal operation modes, along with 2-stage pumps and dual action wedges. Dual action wedges have the ability to cut logs in the return stage of the cycle as well, so you can execute two cutting operations per splitter cycle. Unlike the hydraulic splitters that we have been discussing until now, kinetic splitters rely on the momentum of a spinning flywheel to drive the wedge through a log of wood. A rack and pinion arrangement forms the basis of a kinetic splitter, and the flywheel in these might be single or double types, with weighs above 70 pounds. A motor spins the flywheel, and when you engage the activation lever for the splitter ram, a toothed rack comes in contact with a gear like pinion that is connected to the spinning flywheel. The ram slides forward on the rail and pushes the wedge into the wood. After reaching the end of the maximum extension range, the ram is pulled back into position via a reverse gear assembly, or a spring mechanism. Kinetic splitters feature cycle times of less than 5 seconds, making these the fastest log splitters on the market. Their weight is one of their biggest disadvantages, since even a small sized kinetic splitter can weigh more than a medium sized 10 ton gas powered hydraulic splitter. How to choose the Perfect Log Splitter? There are many aspects to a log splitter that need to be considered before you purchase one. However, the features which we have listed below are the ones that matter the most, so take your time and go through them thoroughly. Companies will try their best to market a certain model and use big numbers to lure you into thinking that a 25 -ton splitter is better than a 15 ton one. However there are many companies out there who post false or inflated figures and use cheap, inferior motors while designing their splitters. Stick with reputable brands and check the model, as well as the manufacturer of the motor before you buy any log splitter. Make sure that spare parts are easily available, and you’re getting proper warranty coverage. Gas is the way to go if you need more than 10 tons of crushing force, or if you plan to cut large logs of hardwood in small amounts of time. They might be loud but can run almost anywhere, unlike the electric models which are quieter but require an external power source in order to function. If you are interested something that will only cut like a quarter or half a cord of wood over a year, then a manual splitter makes the most sense. Clearly you don’t care about speed since there is a much smaller volume of wood to process, and manual splitters are the easiest to move around due to their size and weight. They are also the cheapest and easiest to maintain of all splitter types. Kinetic splitters are a niche product since they are quite heavy and difficult to maintain due to their unique operating mechanism. Triple-point variants make sense only if you have a tractor to pair with the splitter. Motor design determines the volumetric flow rate of hydraulic oil inside a tube network, and motor power affects the psi rating of a splitter. With more pressure being applied on the pumping end, you can expect greater tonnage ratings from the splitter. Horsepower can be a very subjective aspect when it comes to how big of an impact this has on the tonnage. A 10 horsepower motor might output the same tonnage as a 5 horsepower motor because of the minor variations in valve design, pump type, cylinder bore, etc. Generally speaking though, having more horsepower gives your splitter extra headroom to push itself, and there are fewer chances of an overload happening when the motor is powerful. With a weaker motor, you’ll still be able to cut logs at a fast rate as long as you stay within spec. However as soon as you go beyond the recommended hardness levels or size recommendation for the logs, your splitter might not even penetrate into the log, let alone move slowly through it. Faster flow rates mean faster cycle times. This has nothing to do with actual splitting strength, and is merely an indication of how fast the hydraulic fluid can move from the source to the hydraulic ram. With higher flow rates, the wedge will move back to its resting position much faster, and you’ll be able to make the most out of your splitting machines speed and power since you’re not bottlenecked by excessively long reset times. Try to get a splitter with a dual stage pump. A dual stage pump allows for faster reset times by increasing the flow rate when the ram is retreating into its resting state. There are two separate pumping sections in a dual stage pump- one is optimized to generate maximum working force for splitting tough logs of wood, the other is designed to operate the piston of the ram at greater speeds while compensating with a decrease in force. Horizontal operation is great for small to medium sized logs, i.e. anything between 6 to 12” in diameter. Any larger than that, and it can be a truly tiring experience when you have to manually carry each single log over to the splitting platform, and align it with the wedge as well as footplate. It would be great if you could just roll the log into position, and set it upright whenever you need to split it, just like when working with a maul. Well, with log splitters it’s possible when using the vertical splitting position. Many medium to large size gas splitters come with this feature. It allows you to swing the whole rail and ram assembly into a vertical alignment, while the motor and stand stay constant. This way the wedge travels vertically in an up-down motion, and you can simply roll large logs into place. Now you’re finally ready to explore the market and check out all sorts of consumer as well as prosumer grade log splitters. When we say “prosumer”, we basically mean any log splitter with a tonnage of 25-35 tons, and a dual action wedge design. With the dual-action wedge you’ll be able to cut logs a second time as the ram is returning to its original starting position. This is normally achieved by planting the shaft beneath the rails or splitting platform, so that both sides of the wedge are free to come in contact with the wooden log. It is a neat little trick to increase productivity, but is normally found only on larger gas operated splitters, or on most three point hitch splitting machines (the ones that are attached to tractors).